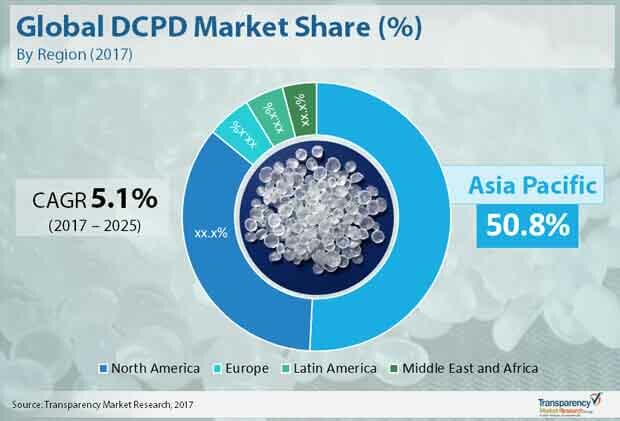 The global dicyclopentadiene (DCPD) market is highly fragmented due to the presence of various large and small players operating in the market, observes Transparency Market Research. Competition among these players is also expected to rise in the coming years. Leading players in the market are adopting new strategies such as collaboration, mergers, partnership, and other to get a firm hold in the market. For instance, Dow Chemical Company merged with E.I. du Pont de Nemours & Company (DuPont) and started DowDuPont. This merger will result in strengthening their position and will fuel growth in the global dicyclopentadiene market. Few other players in the global dicyclopentadiene market are Chevron Philips Chemical Company, Shell Chemicals, Maruzen Petrochemical, Zibo Lujua Hongjin New Material Co. Ltd. and LyondellBasell. The global dicyclopentadiene market is anticipated to reach US$0.902 bn by the end of 2025 progressing from US$ 0.56 bn earned in 2016. To reach this valuation, the market is projected to rise at 5.5% CAGR over the projected tenure. Application of dicyclopentadiene is likely to rise in EPDM elastometers and hydrocarbon resins segments. EPDM elastometers provides incomparable resistance to heat, steam, ozone, and water, which has increased use of dicyclopentadiene in this segment. Moreover, the demand for unsaturated polyester resins also increased due to its outstanding mechanical and functional properties such as heat resistance, corrosion, and low weight. These factors increased use of dicyclopentadiene in these two segments and drive the overall demand in the global dicyclopentadiene market. Geographically, North America is projected to lead the market on the account of growing marine, plastics, and polymer industries. However, strict regulations on exposure to DCPD might deter growth of dicyclopentadiene in Europe. On the other hand, Asia Pacific is projected to fuel demand in the global dicyclopentadiene market due to increasing development in infrastructure and construction industries. Developments taking place in the plastic and resins industries are likely to expand the global dicyclopentadiene market in the forthcoming years. Significant rise in the plastic industry in Asia Pacific has boosted demand for dicyclopentadiene thus, contributing a promising rise to the global dicyclopentadiene market. Dicyclopentadiene is used for manufacturing different types of resins such as epoxy resins, aromatic hydrocarbon resins, phenolic resins, acrylates, lattices, unsaturated polyester resins, specialty resins, and other specialty intermediates, which has further augmented demand in the global dicyclopentadiene market. Adding further to the growth prospects in the global dicyclopentadiene market is the growing use of poly-DCTD. The demand for poly-DCTD is rising due to its lightweight properties that do not hamper performance of vehicle. Growing preference for lightweight automotive in vehicles, as they increases fuel efficiency in vehicles. These factors have accelerated demand for dicyclopentadiene in automotive industry. Environmental concerns related with the use of exploration & production activities along with wastewater treatment in oil recovery are the major reasons deterring the growth in the global dicyclopentadiene market. High cost of production and manufacturing of dicyclopentadiene might obstruct the growth in this market. Additionally, shifting trends towards renewable sources is another factor that might challenge the market’s performance. Rising use of phthalic anhydride as a DCPD substitute in building boats is another restraint needs to be tailored. The study presented here is based on a report by Transparency Market Research (TMR) titled “Dicyclopentadiene (DCPD) Market (Application - Unsaturated Polyester Resin, Hydrocarbon Resin, Ethylene Propylene Diene Monomer (EPDM) Elastomers, Cyclic Olefin Polymer (COP) and Cyclic Olefin Copolymer (COC), Poly DCPD, Pesticide, and Flame Retardant) - Global Industry Analysis, Size, Share, Growth, Trends, and Forecast 2017 - 2025”.